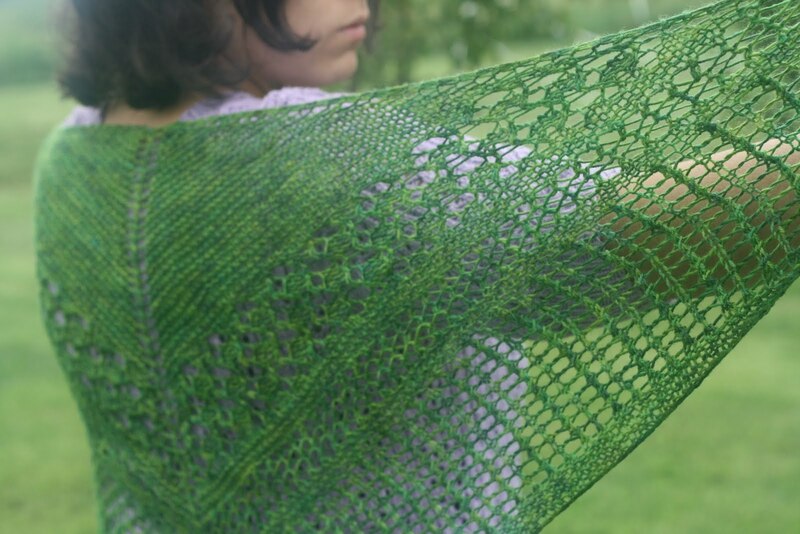 This summer I had the opportunity to test knit for the first time. It was a lot of fun, and I hope I'll be able to do it again. 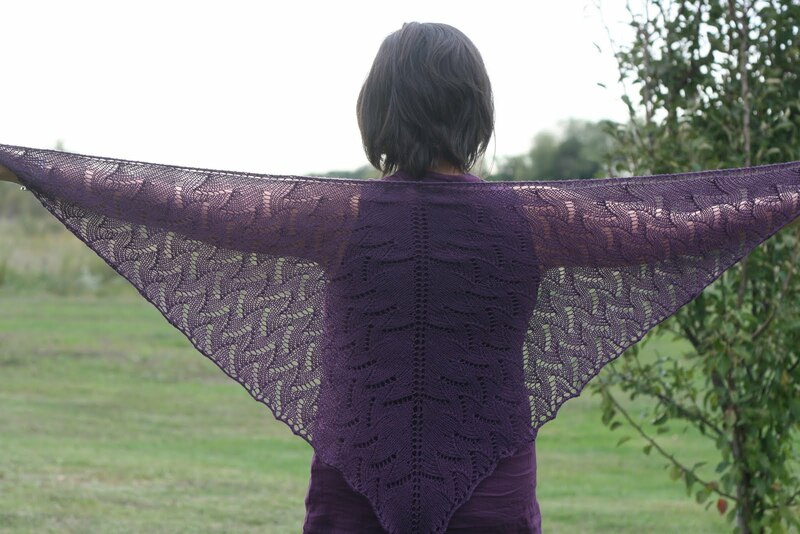 The first pattern I test knitted was the Curatio Shawl for Kirsten at Through the Loops. 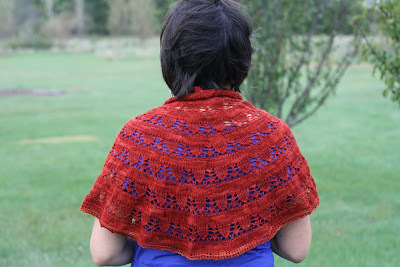 The pattern was great - it has three different (but easy!) 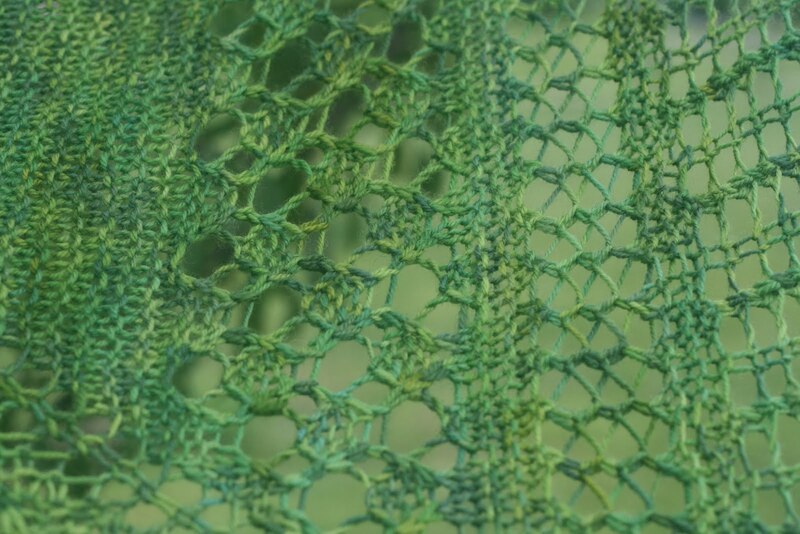 lace patterns and they are separated by garter stitch bands. The pattern never gets boring, and is very enjoyable. 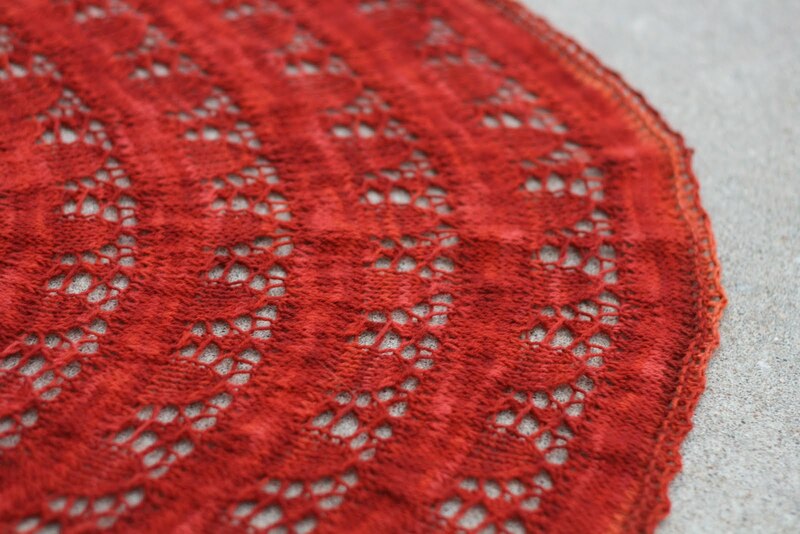 On the first lace section, the lace pattern is worked on every row. I'd never done this before and was a bit worried, but it was really quite easy. I used a skein of Dream in Color Smooshy, and this is some of the best sock yarn out there - so soft and the colors are beautiful! 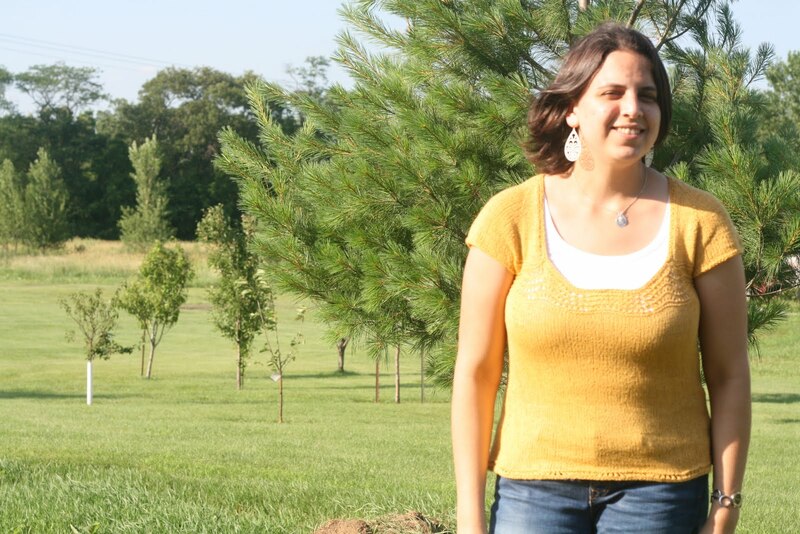 My second test knit was also for Kirsten. 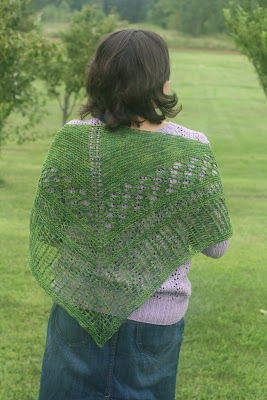 I was so happy to get to test here gorgeous Snow Drop and Snap Peas shawl. 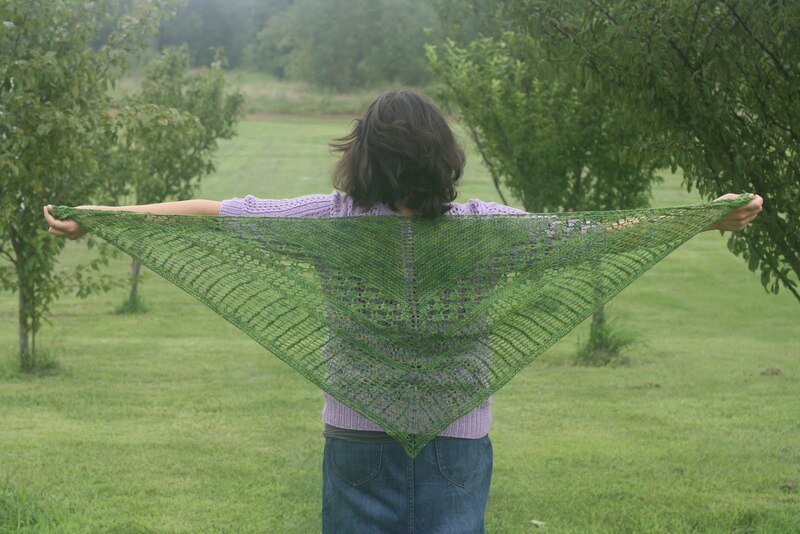 This was my first time knitting a semi-circular shawl, and I can't wait to knit another one. 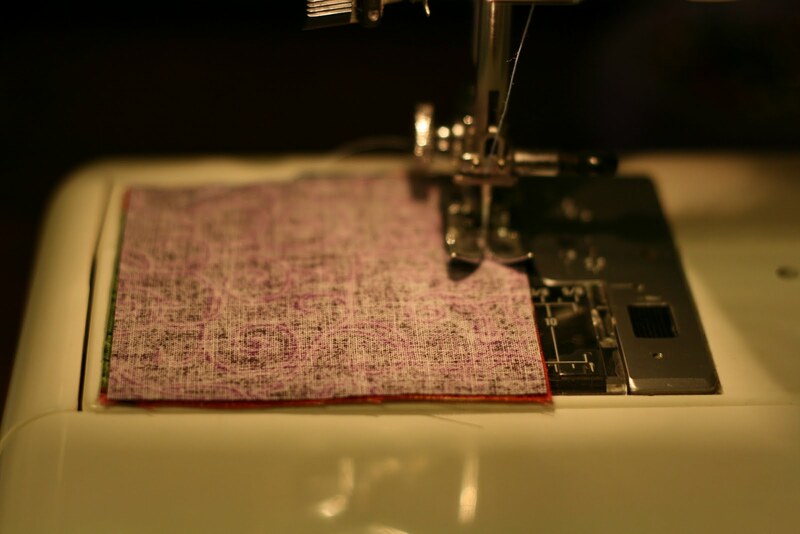 The pattern was quite easy and enjoyable. The rows toward the end get very long with 400 - 500 stitches, but it's totally worth it! I used Araucania Ranco for this one, and forgot to check my yardage. I ran out of yarn about 4 rows from finishing the shawl, but thanks to a fellow Raveler was able to procure another skein. The lesson here - all sock yarns are not equal! Some have less than 400 yards in a skein, though it can be hard to remember when so many have 400 yards plus. You will definately need at least 400 yards to finish this shawl. 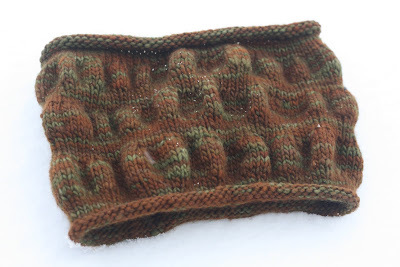 My third test knit was for Oiyi. 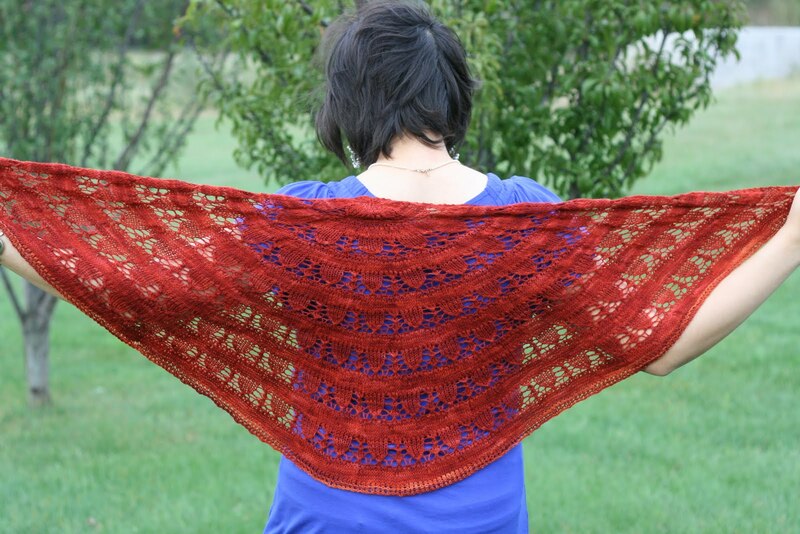 This is her newly released LaReine Shawl. 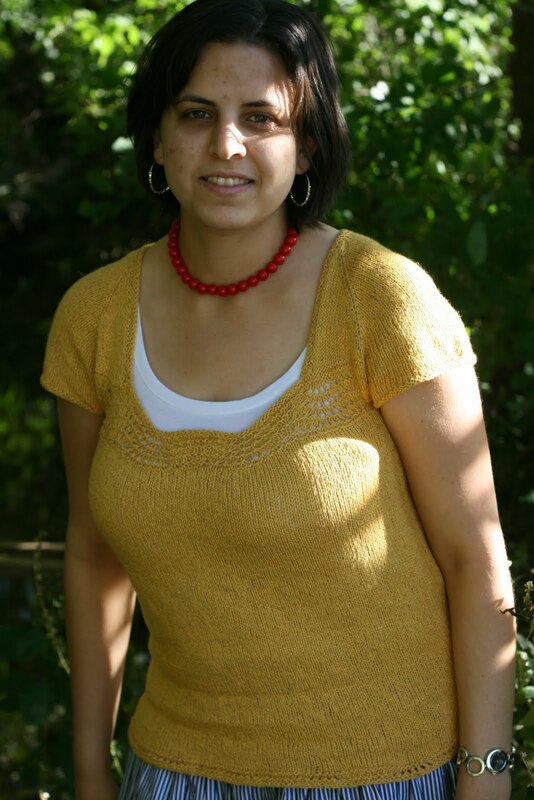 I loved knitting this pattern. 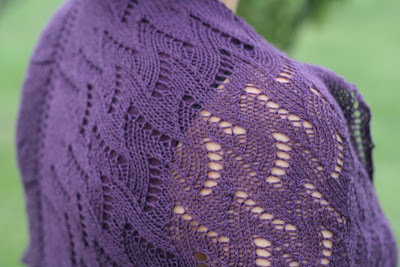 The lace is easy but not boring, and I especially love the beautiful pattern that forms around the shawl's spine. This was my first time using Cascade Heritage Sock Yarn, and it's a great yarn. It's quite soft and wonderful to work with. I've got two more skeins of it in the same color, so I'm sure I'll be using it again. I had a very small ball of yarn left after finishing the shawl. I decided to try the sweater again this summer. In a fit of brilliance (not!) 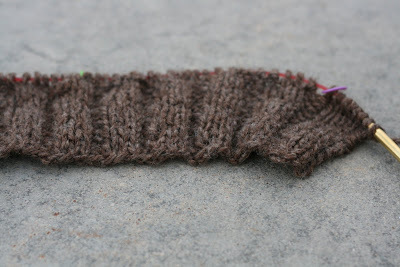 I decided that instead of using the one odd skein by itself in the first half, I'd alternate rows with another skein. Let me just say, bad idea. I somehow convinced myself it was okay and finished the sweater. You can see the striping in this photo. Also, the neckline was too low for my taste - it just looked weird with a shell under it. 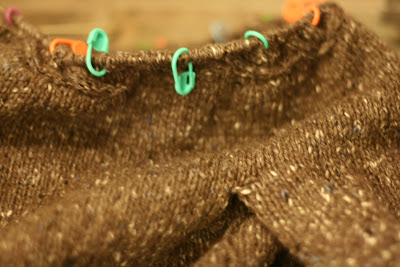 I like my sweaters to be about 15" from the underam to the hem. After trying it on, I decided that even though the sweater was about 2" short of that, it felt okay, and bound off. Another bad idea. It was too short, ending at the widest part of my hips, not flattering at all. I decided to try again, with only the six balls of yarn, and using option B of the pattern, which has a higher neckline. I also decided to make the body length 15", and not go by the try-on length. 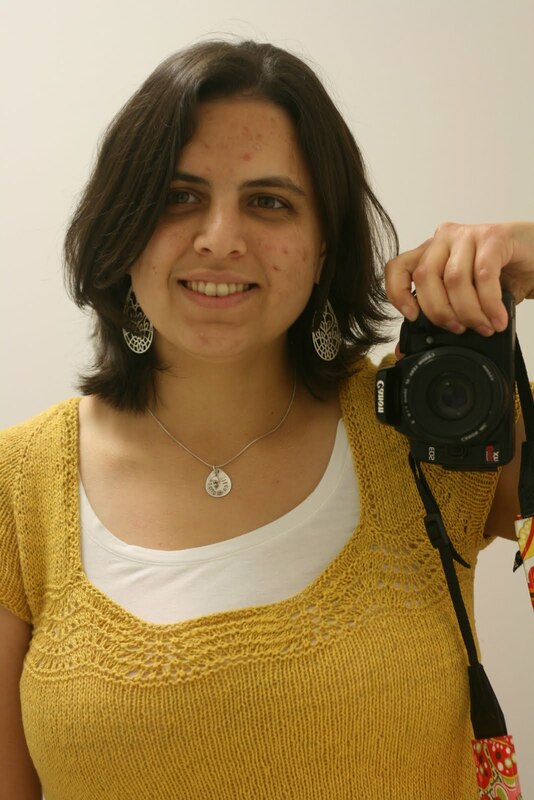 I'm so glad I tried again, because I love this sweater! This is the second time I've used this yarn, and I love it. 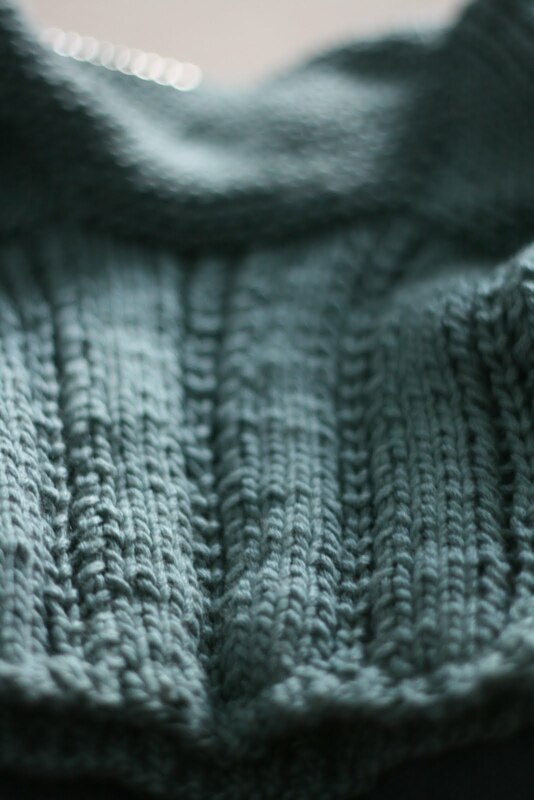 It's a bit rough to work with, but it wears incredibly well, and makes a very comfortable sweater. I finished this in late summer and didn't get a lot of time to wear it before fall, but I hope to enjoy it next year. And I'm so glad for this lesson that I was able to use this past weekend. 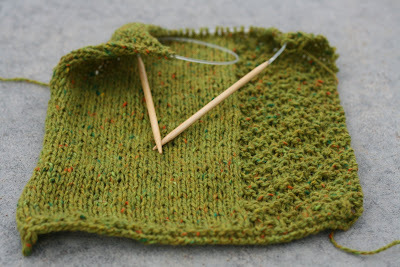 I was working on my Tree Jacket and made a mistake which I realized a few rows afterwards. I tried to brush it off, but finally decided to rip a few rows and fix the mistake. 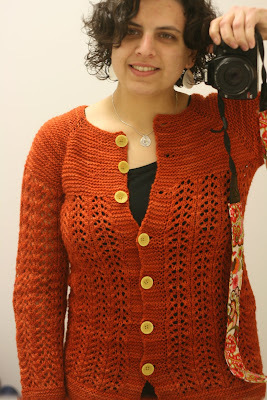 I'm so glad I did, because the mistake would have thrown off the pattern of the whole sweater yoke. 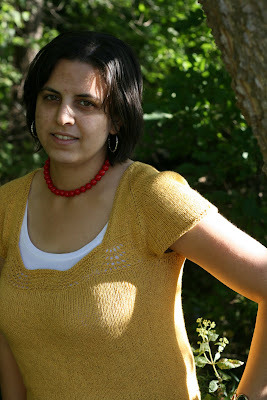 I'm absolutely loving this knit, and the Cascade Venezia - it's sooo soft and silky smooth! 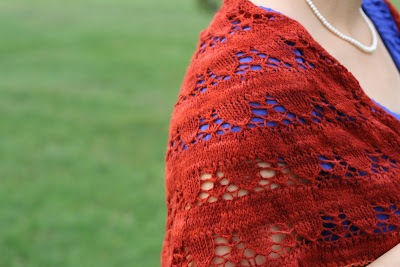 So How Hard Can it Be to Get a Finished Sweater Photo? I finished three sweaters last winter and I never managed to get decent photos of them. Hopefully now that fall is here I'll get some good modeled photos. I should probably also ask how long it'll take for me to not try to use yarn that cannot really be salvaged. 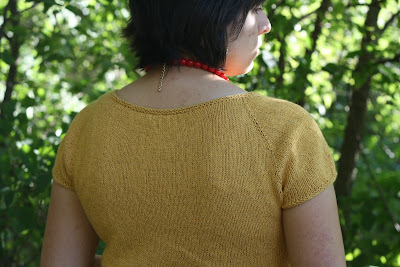 Last summer I started a Buttercup sweater in Elsebeth Lavold Hempathy. I had a total of 7 balls, 6 of one dyelot and the 7th a different one. I really should have known better than to try to use that one odd ball in the sweater. I tried alternating rows for the first part of the sweater with one of the other balls, but the color change was still quite noticeable. 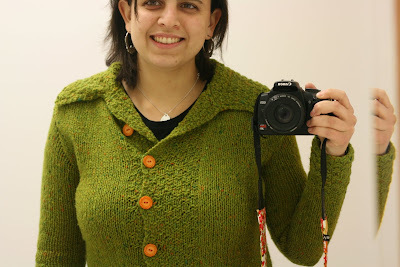 I also made the sweater too short and didn't like how the neckline came out. So, I decided to frog the thing and make it again. I'm so glad I did, because it came out perfectly! Photos next time! ...but hopefully I'll be blogging more. I had a great summer - it went by way too fast, and I still can't believe its almost the middle of September already. 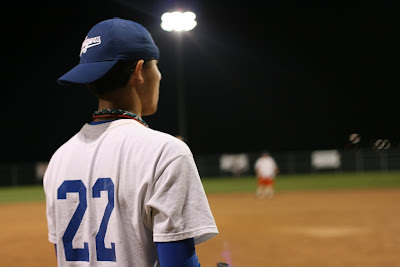 The summer was, once again, full of softball. I attempted to get back to sewing a little and really didn't do so well - I'm not very good at tearing myself away from my knitting and sewing just isn't portable! I started running about 4 - 5 times a week in June. I'm very surprised - for someone who is very prone to staying inside doing activities that always require nothing but sitting, I've grown to really enjoy running. 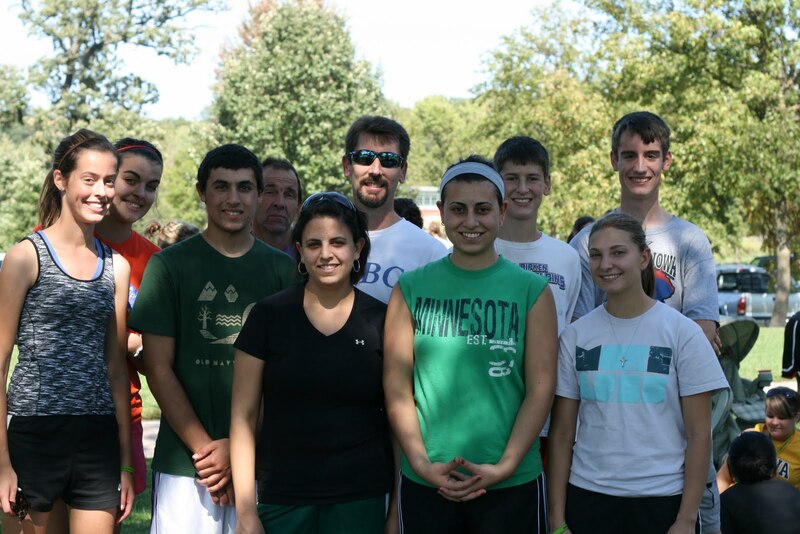 The best part was running my first 5k this past weekend with some of my family and friends. It was so hard and I thought I was going to die towards the end. That's why I can't wait to participate in a 4 mile run this weekend ;) Seriously, there's something satisfying about being able to run farther and farther, especially if you didn't think you were going to be able to do it. Mods: Lengthened the sweater, shortened the ribbing portion on the sleeves & body of the sweater. 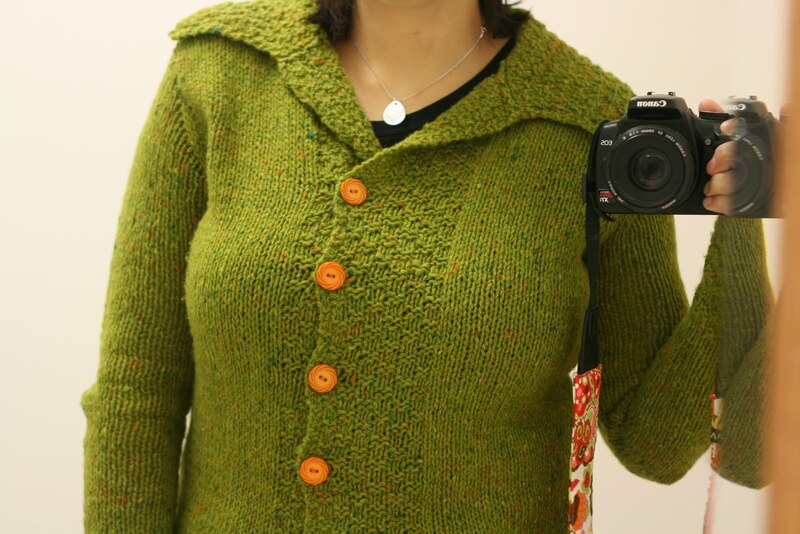 Rowan Felted Tweed is a bit expensive, but it's so worth it. This is some of the nicest yarn ever! I love this sweater, and it's too bad I didn't finish it until late February and didn't have much time to wear it before spring. The one thing I did wrong was to not add more buttonholes to go with the added length. There's some definate button gaping going on, and I may try to fix it with snaps. 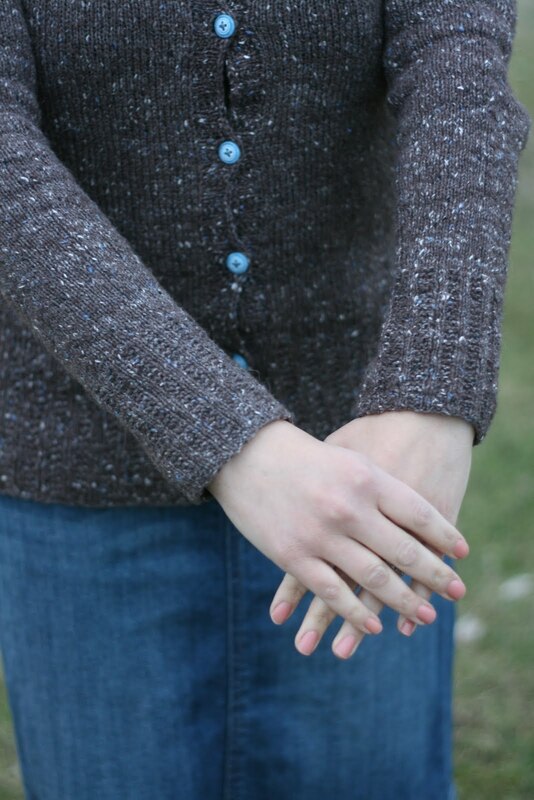 Just something to keep in mind when lenthening a cardigan! I hope your autumn weather is as nice as ours has been! So I've sat down to write this post several times and just have never finished it - but now I've finally done it! 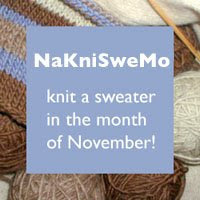 At the beginning of this year, even though I failed miserably last year, I decided to try to knit 12 Sweaters in 2010. I also decided to knit 12 pairs of socks this year. I'm still hoping I'll be able to meet my goals, but I'm not so sure I'll be able to. 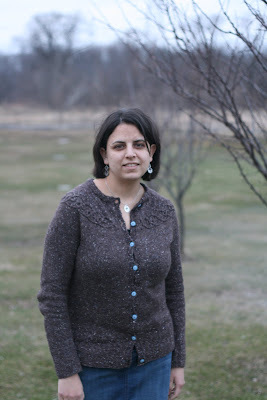 The first sweater - the Tangled Yoke Cardigan - has been completed and worn several times, I just need to get photos now. This sweater seemed to take forever, especially the yoke cable rows, but it was an enjoyable knit as well. It's definately a new favorite! 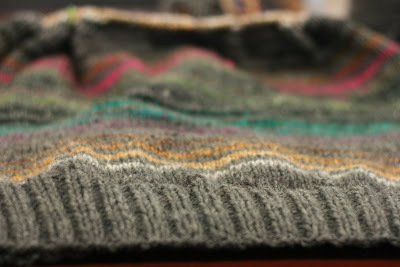 I also started my February Sweater - a Noro Striped Vest. 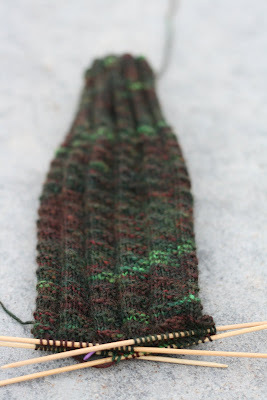 I started off alternting four rows of the Noro Silk Garden and Cascade 220. I really didn't like how it was coming out and I hadn't added any waist shaping, so I ripped down to the ribbing and started again, doing two row stripes. I like it much better now. I started a pair of socks in January and finished the first one. I still haven't cast on for the second. 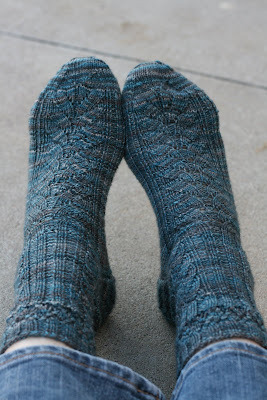 These are the Dead Simple Lace Socks from Socks From The Toe Up by Wendy Johnson. 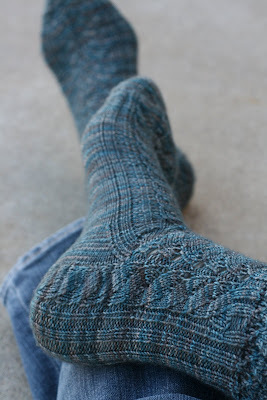 I also cast on for but did not get very far in my February pair - the Basket Weave Rib Socks from Sensational Knitted Socks. So, March will be a month for finishing! I've also go my Gentleman's Shooting Stockings that have been on the needles since July of last year, and the February Lady Sweater that's almost done. I hope you all are having a great March - I'm so glad that all our snow has melted and the weather's finally warming up! 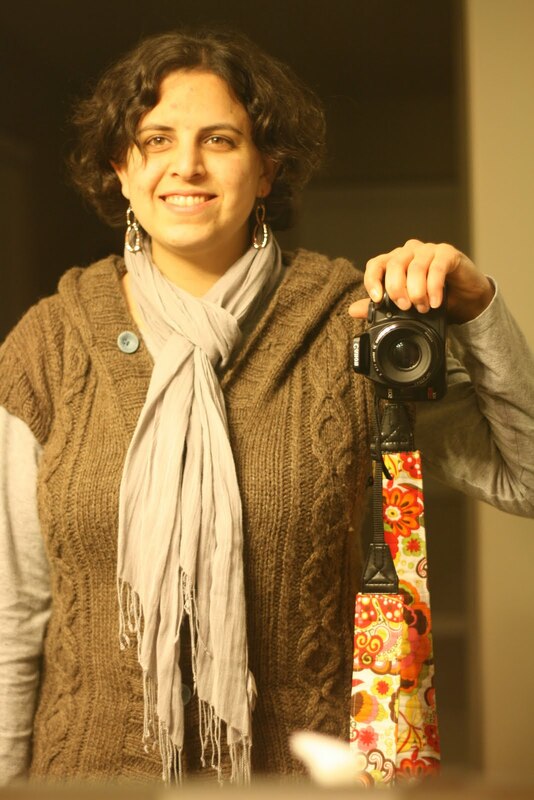 So it's been ages since I blogged. I'm going to try again, and see if I can keep it up this time! I haven't been knitting as much as I used to. Mostly because I've had other activities with friends, my family, and I've also been exercising a lot more. And I must say, as much as I have to force myself to get on that treadmill every day, I sure feel better afterwards and am always glad I did it. Anyways, since my last post, I've finished a few more projects. The first, my DROPS Jacket. Mods: Many! 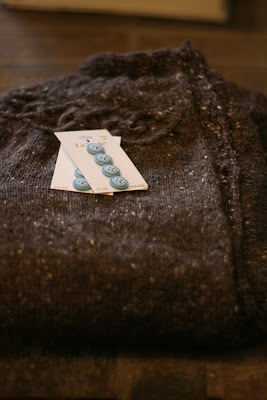 I did't want a swing cardigan as they look like a maternity top on me. So I cast on for the smallest size and increased up for the bust. I also made the sleeves a bit smaller. I made the collar according to the pattern, but didn't sew it down to the cardigan so I had a collar that laid down instead of a turtleneck collar. 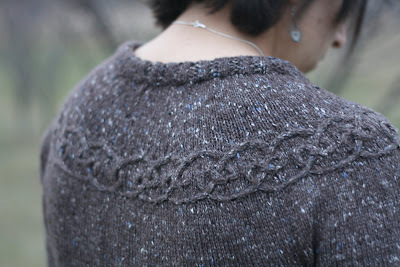 I love how this sweater came out and have been wearing it often. I can't believe it only took 4 skeins of yarn - I've got 6 more skeins of the Rowanspun Aran for another project! 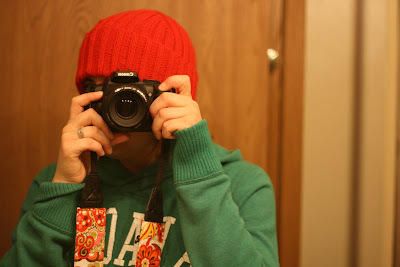 I participated in my first Mystery Knit-a-Long in October for the Through the Loops Mystery Sock. It was tons of fun, and I loved the pattern. 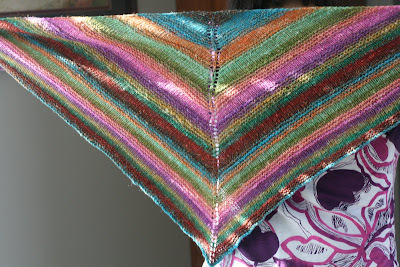 I really wanted something simple and midless to make in December and made another Noro Shawl. So there's my finished products lineup. See you guys next time - and stay warm! Hi everyone! I hope you're all having a wonderful fall. It was cold and cloudy and sometimes rainy the past few days but today was beautiful and sunny. 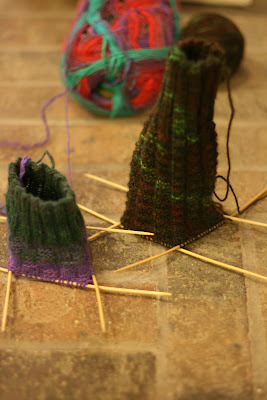 The Noro Baby Cable Rib Socks are finished. 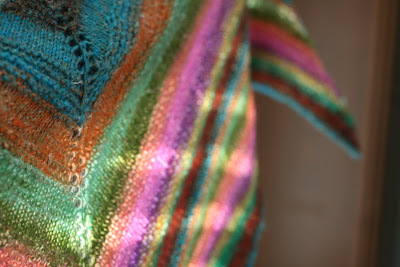 Another great pattern from Charlene Schurch, and I love love love this Noro colorway. 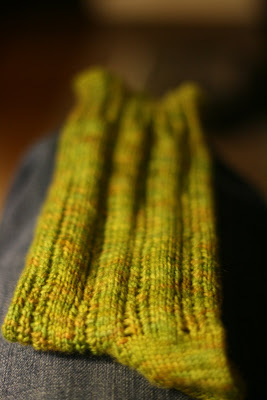 The Sunrise Socks for the Sock Knitters Anonymous Group on Ravelry are also finished. I loved knitted these socks. 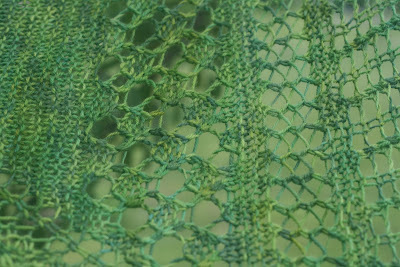 The pattern is so simple and breaks up the pooling wonderfully. 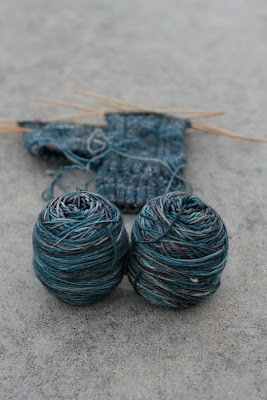 This was also the first time I've made toe-up socks with a heel flap instead of a short-row heel. It was very interesting to see it take shape. This was my first time using Lorna's Laces yarn and I'll definately use the Shepherd Sock again. It was wonderfully soft and smooth to knit with. 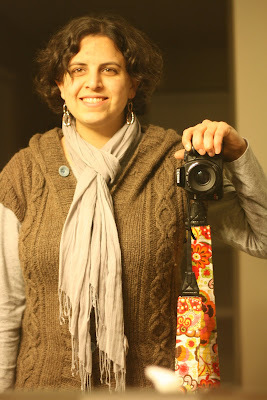 Also, the Noro Scarf is finished. Scarves usually take me forever to finish - they just stretch on and on and on. But this was finished in literally 7 days. Noro rules! I would definately make one of these again! In the WIP department, the back of the DROPS jacket has been finished (except for the shoulder shaping) and the left front is also finished and the right front is about half done. 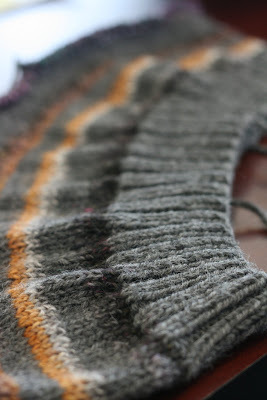 I started a Heather Hoodie Vest in Cascade Ecological Wool. The Gentleman's Shooting Stockings are progressing quite slowly but surely. And I'm having lots of fun with the Through the Loops Mystery Sock KAL. 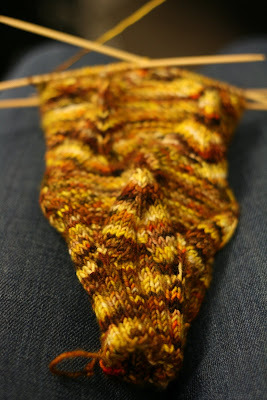 I'm using Malabrigo Sock in Persia. Worshiper of Jesus Christ. American. Armenian-Mexican. Love my family & friends. 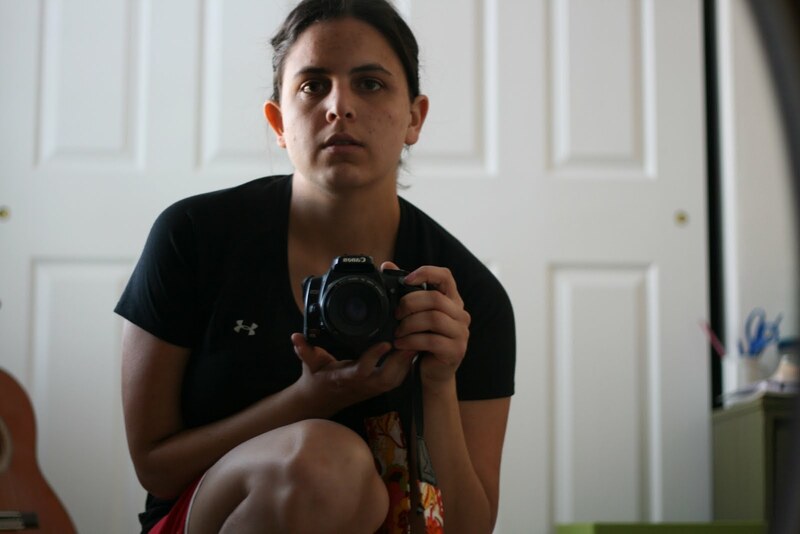 Eater of yummy foods, knitter, runner, worker, student.